Almost to nice to put holes in, but I am on at least two or three. Was in the printing industry for 35 years and these are really well done. 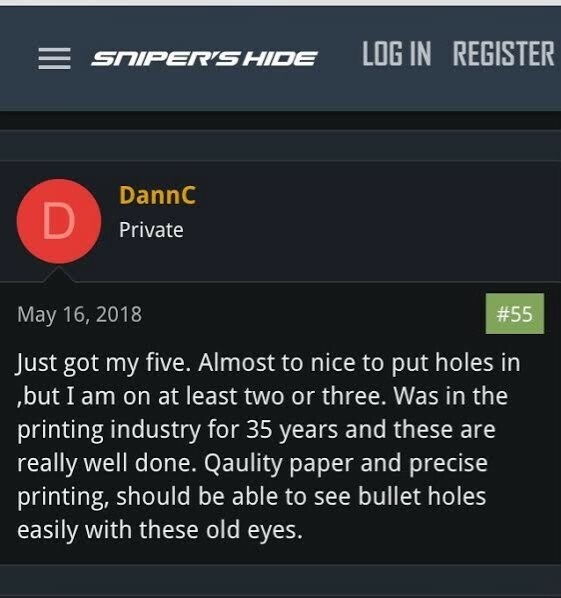 Quality paper and precise printing, should be able to see bullet holes easily with these old eyes. Thank you for talking to me about the Mill and MOA markers on your targets. They are very accurate. While using the long Range 100 yard Load Development/Scope Tracking target and my new scope, it helped me realize that my scope wasn’t tracking correctly (both turrets). I sent it to the manufacturer. When it came back, and using your target as my known constant... the scope is now spot on accurate. I brought a bunch of these to the range for my buddies and we had a blast working the turrets and landing a bullet right where it’s supposed to go. These targets are a great tool to gain a better understanding of your rifle, scope, turrets, bullets etc, all on one sheet. I’m looking forward to using the load development to find my best jump to lands and powder combinations and keep them for later review. As a hunter I would never take the shot unless I had a clean kill.. your targets give me the confidence in my equipment to take that shot. Finally, someone had the thought that the Walmart targets were simply not cutting it anymore in the precision shooters world. Box to Bench Precision contacted me roughly a month ago and wanted to send me some serious targets and wanted my thoughts. So, they sent me a few different types they had in stock. When they showed up rolled in a big bazooka type tube after a 2-3 minutes fight with the tape I got the endcap off and rolled them out. My first initial thought was simply wow, these are some seriously specific and detailed oriented targets. The thought of being able to order just a few targets and by the time you are done shooting you will have a very in depth knowledge of both your rifle and scope is astonishing. These targets are a major step up from the sheet of cardboard with orange sticker everywhere that I used to use. The first one I shot was the 100yd Long Range Development and Scope Tracking Target as I was working on the load data for my new 6.5 Creedmoor. After you get your rifle zero’d you would use this one to help perform your ladder test for your various load data. It also gives you a few targets to see how your scope tracks your shots with that specific load data. One of the most important targets in my opinion is the Rex Grid- 100yd MOA grid scope testing target. It gave me a very solid feel of my scope because we all know just because it says “1/4 MOA adjustments” doesn’t mean that there is no room for error even if it is extremely minimal that fact that its there is going to count. For instance, if it is maybe 1/16th” off at a 100 yards it is going to continue to get further off when you add more distance. This target will prepare you for that in my opinion and let you take the correct action whether it would be a slight holdover on the reticle or maybe an extra click of the turret. If you had a “shoot and see” from Walmart this detail would of most likely been overlooked. The most fun I had with the targets was with the Sniper’s Hide 100yd Scope Tracking Target though because I had a buddy shooting with me so we made it a race. Just one of these targets are actually two sides so its basically two in one. As we were tracking left and right and running turrets we would call our color box and kept them alternating to present a challenge. Not only was this fun and competitive but it was extremely great for practicing adjusting the turrets because it was a race to the bottom. Id recommended either timing yourself or challenging a friend with this target because you will in my opinion because faster and much better behind the glass afterwards. Box to Bench Precision in my opinion has some very serious potential to help you improve your shooting speed and repetitiveness of better accuracy. They run these targets pretty cheap as well for the quality of paper they use ranging from just $2 up to $4.50 a pop with some pretty heavy bulk (5-10) discounts. I am going to start recommending these to everyone that wants to take their shooting to another level because I believe they will help in many ways. They are going to provide you with some serious knowledge about your rifle and scope and put you one step closer to the rifle being an extension of you. No luck, Pure skill always harness your skills and take every advantage and go check them out here.